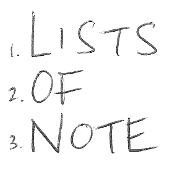 Lists are created for all manner of reasons, and have been for many centuries. It's my aim to feature some of the most notable examples right here. Updated as often as possible; usually on weekdays. Edited by me, Shaun Usher. I also run Letters of Note. 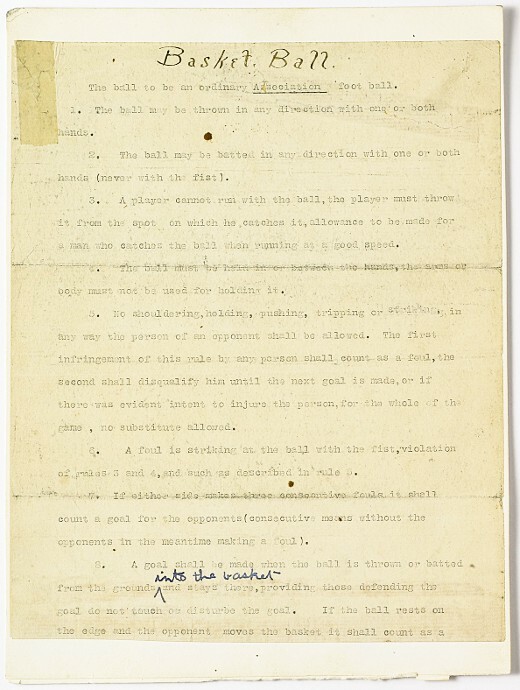 In December of 1891, after being asked to invent a new indoor game for his students during the winter months, a Canadian teacher named James Naismith wrote the following 13-point list of rules and attached it to the wall of a gym at the Y.M.C.A. Training School in Springfield, Massachusetts. The game he had invented was basketball. 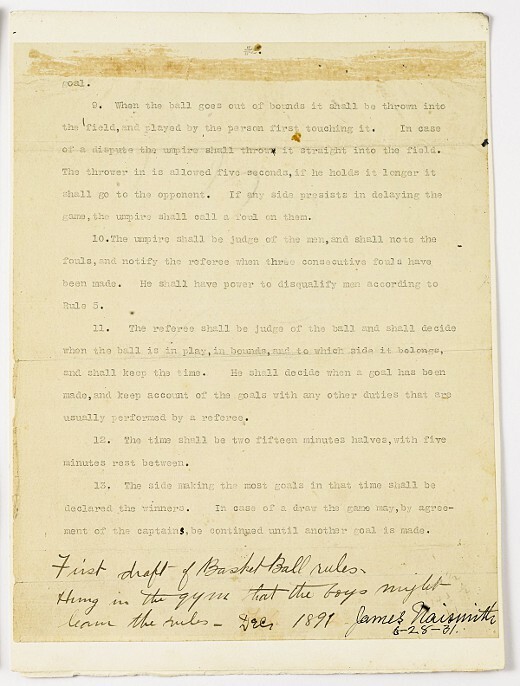 Over the years the list evolved to include rules for such things as dribbling and dunking; today, the official rules of basketball (PDF), as approved by FIBA, are 80 pages long. Transcript follows. Images courtesy of Sotheby's, who sold this original list for $4.3M in 2010. The ball to be an ordinary Association foot ball. 1. The ball may be thrown in any direction with one or both hands. 2. The ball may be batted in any direction with one or both hands (never with the fist). 3. A player cannot run with the ball, the player must throw it from the spot on which he catches it, allowance to be made for a man who catches the ball when running at a good speed. 4. The ball must be held in or between the hands, the arms or body must not be used for holding it. 5. No shouldering, holding, pushing, tripping or striking in any way the person of an opponent shall be allowed. The first infringement of this rule by any person shall count as a foul, the second shall disqualify him until the next goal is made, or if there was evident intent to injure the person, for the whole of the game, no substitute allowed. 6. A foul is striking at the ball with the fist, violation of rules 3 and 4, and such as described in rule 5. 7. If either side makes three consecutive fouls it shall count a goal for the opponents (consecutive means without the opponents in the meantime making a foul). 8. A goal shall be made when the ball is thrown or batted from the grounds into the basket and stays there, providing those defending the goal do not touch or disturb the goal. If the ball rests on the edges and the opponent moves the basket it shall count as a goal. 9. When the ball goes out of bounds it shall be thrown into the field, and played by the person first touching it. In case of a dispute the umpire shall throw it straight into the field. The thrower in is allowed five seconds, if he holds it longer it shall go to the opponent. If any side persists in delaying the game, the umpire shall call a foul on them. 10. The umpire shall be judge of the men, and shall note the fouls, and notify the referee when three consecutive fouls have been made. He shall have power to disqualify men according to Rule 5. 11. The referee shall be judge of the ball and shall decide when the ball is in play, in bounds, and to which side it belongs, and shall keep the time. He shall decide when a goal has been made, and keep account of the goals with any other duties that are usually performed by a referee. 12. The time shall be two fifteen minute halves, with five minutes rest between. 13. The side making the most goals in that time shall be declared the winners. In case of a draw the game may, by agreement of the captains, be continued until another goal is made. 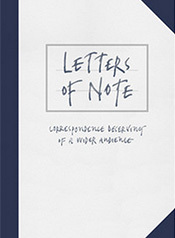 Comments are closed on Lists of Note. Have something to say? Get in touch via email or Twitter. 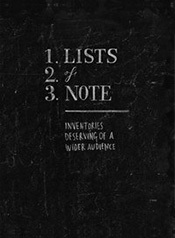 You can browse the archives of Lists of Note here. Alternatively, below are the most popular lists.